There's nothing more important than the safety and security of your business and property. Its comforting to know that day and night, at home or away, that the things you own are safe and the people you care about are protected. Feel this sense of comfort and security with Defender's SENTINEL3. See your business or home from multiple angles or monitor several different areas all at once. This versatile system is the perfect security solution for convenience stores, large properties and warehouses. You can do it all with this system record for over 2 years, display footage on an ultra slim 8.5" LCD monitor, and access the system online so you can view your property at any time, from any Internet enabled PC in the world! The eight included cameras are equipped with automatically activating night vision that allows you to see your property and belongings, even in total darkness! Let the SENTINEL3 give you the peace of mind that comes with the convenience of viewing your property day or night from any location! This system is extremely user-friendly and you can have it up and running in a matter of minutes because everything is truly plug and play. Auto-start recording ensures that the SENTINEL3 will automatically begin recording as soon as you plug it in to a power outlet. The SENTINEL3 can capture up to 750 continuous days of video and once the hard drive has become full you can choose to overwrite your old video or have the unit stop recording. This smart DVR will also alert you when the hard drive has become full with video footage. The 8.5" color LCD monitor is a slim and compact way to see what's happening on your property. With several customizable viewing options, you can decide which area of your property you want to see and when you want to see it. 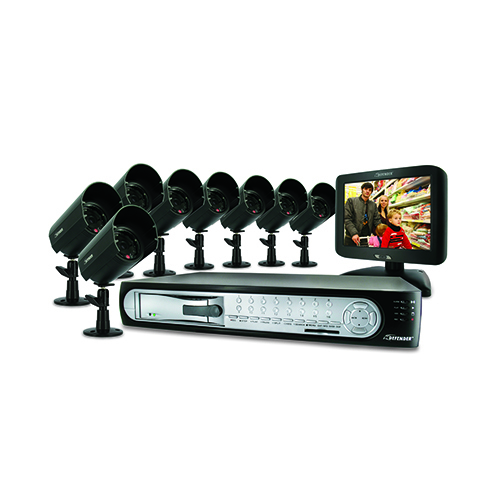 View one camera at a time, quad view with four cameras, or even view all eight together, all on one screen! The included remote control makes it easy to change camera views and display options. The 320GB hard drive can hold over 2 years of continuous video and is optimized for 24/7 surveillance. We only use hard drives that are specifically designed for high capacity writing, which ensures long product life and accurate video data storage. Your DVR will alert you when your memory space is full so that you can overwrite your old video, stop the unit from recording, or backup and transfer your video footage.